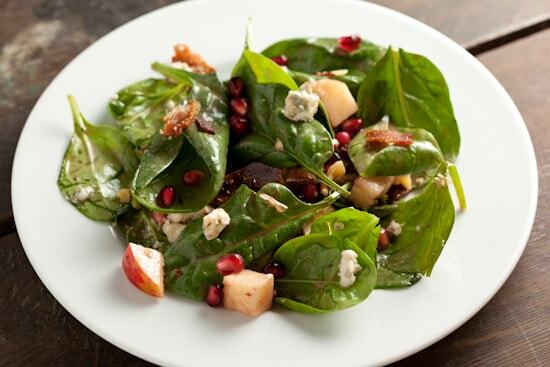 This spinach pomegranate salad is loaded with all my favorite goodies: apples, bacon, blue cheese, walnuts, and pomegranate arils! The delicious salad is dressed with a simple, sweet and tart pomegranate balsamic vinaigrette that perfectly blends the flavors together. Fall has finally arrived here in California, bringing thunder, rain, and the cooler temperatures I’ve been waiting for. While these cool gray skies have me dreaming of hearty soups and warm baked goods, the theme for this week’s Fall Fest is fall salads. I decided to take advantage of our local pomegranates and use both the fresh seeds (arils) and bottled juice in this baby spinach salad. I added a bunch of my favorite salad fixings and mixed up an easy pomegranate dressing to tie it all together. Delicious! I’ll save the soup making and bread baking for next week since my kitchen is still only half unpacked. An easy fall salad was the perfect thing for me to make this week. 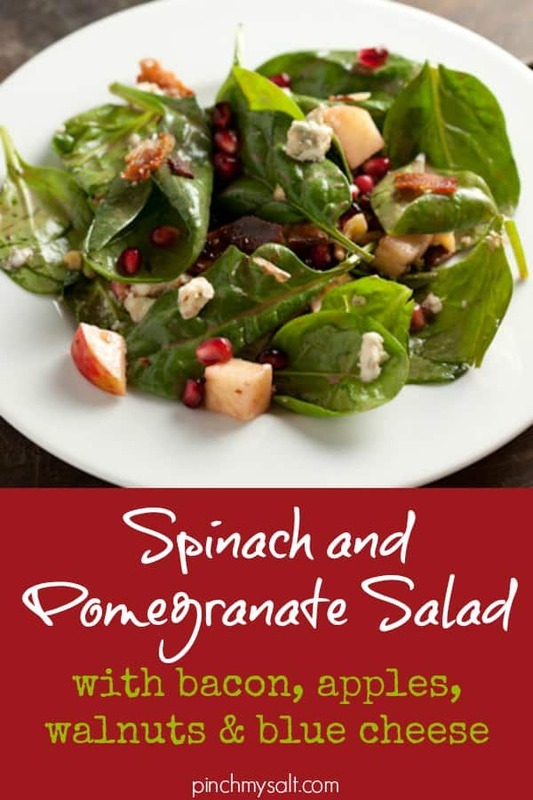 I hope you enjoy this spinach pomegranate salad with pomegranate balsamic dressing as much as I did. Make the dressing: In a medium bowl, whisk together pomegranate juice, balsamic vinegar, mustard, and honey. Slowly drizzle in the oil, whisking constantly, until it's all incorporated. Season to taste with salt and pepper. Reserve 1/3 cup for salad and store the rest in the refrigerator. Make the salad: toss all ingredients in a large bowl. Serve immediately. Here is one of my favorite fall salads.Apple-Pear SaladIngredients:1 (16 oz.) package Romaine lettuce, washed and broken into bite-size pieces 1 (6 oz.) block Swiss cheese, grated 1 C cashews 1/2 C sweetened dried cranberries 1 large apple, chopped and rinsed in lemon water to keep from turning brown 1 large pear, chopped and rinsed in lemon water to keep from turning brown Poppy Seed Salad Dressing (recipe below)Directions:Toss together all ingredients in a large bowl. Yield: 6-8 servings.Poppy Seed Salad DressingIngredients:1/2 C sugar 2/3 C oil 1/4 C vinegar 1 t mustard 1 t salt 1-2 t poppy seedsDirections:Place in jar and shake to combine. I love pomegranate and it goes so well in salads, Nic! This is colorful and fresh - delicious! What a beautiful salad! Definitely printing out the Pomegranate Vinaigrette recipe ~ sounds delish. It looks good for health. I want to eat it. This salad looks wonderful. I love adding fruits to my salads also! what a healthy and tasty looking fall salad! the pomegranate vinaigrette sounds lovely, too. Gorgeous salad and perfect for fall! I know what I'm having for lunch! Oh that looks great! A salad like this for lunch would brighten my day. Isn't the weather in Cali gorgeous lately? We're so lucky! What a gorgeous looking salad, totally my kind of food. Cheers! Tonight I made arugula, walnuts, goat cheese and beets. Fantastic salad! I love yours! wow that salad looks so wonderful. I've never added apples to my salad before but I bet it taste great. I'll try this one out as soon as possible. Thanks for sharing this with us. I am having baby spinach still in my yard, not enough to cook, but good for this delicious salad. Thanks for the idea Nicole. I will be adding some legumes to it for a meal. Great salad, going to have to try this soon!! Thanks for the inspiration! Used my yard spinach and a made a similar salad. Posted it! Love it! This salad looks too beautiful to eat! I love the pop of color from the pomegranate seeds! fall-fest-spinach-pomegranate-salad-with-apples-and-walnutsPrepared this wonderful salad for my office party, its was a hit! The blue cheese really gives it a nice kick! Next time I will add some grill chicken to create a nice light lunch for myself ;0)!!! Thanks for sharing. its really yummy and healthy salad,pomegranate wow .